I'm delighted to bring you another NEW BRITISH Indie polish maker! I'm delighted as its British! We're definitely up and coming with the polishes now which is brilliant to see, and I'm honoured to be able to review them for you guys to see and for you to be able to find them easily!! "I provide the custom ingredients (which are all completely safe and completely legal to transport worldwide) and the bottle to make the polish (if you like). You provide the clear nail polish - any old brand - I've tested lots and they all work fine, and a bit of good old-fashioned elbow-grease (aka shaking ability). The Nelly Mixture contains the 'magic' ingredients to create a lovely jelly/glitter polish which will stay lovely and glittery (no sinking glitter) you just need to mutter "abracadabra" and shake". Not sure about you, but its a first for me, I've never heard of this! I have to confess i was curious about it in this form, but Hilary sent the polish in its complete form to me to try, so maybe ill ask her to send me the mix next time and ill give it a go and post it here! Edited to add: Luckily Hilary is a fab gal and has already said she'll be happy to send me a dry formed one, so be sure to keep an eye out for that review! I'm definitely intrigued by it!! so, the two Hilary sent me to try were called "Bodmin" and "Beeny". This is such a new brand that Hilary has just the very first collection for sale. There are 6 polishes and is called the "Fungooms" collection after her husbands toddler website; www.fungooms.com, but rest assured theres a good solid amount if you want to go and treat yourself (for now anyway!!). If you buy the ready mixed polish it is £6.50 per 10ml bottle. If you were to buy the dried polish to mix yourself its a cracking £5 which includes all the ingredients to make the polish. 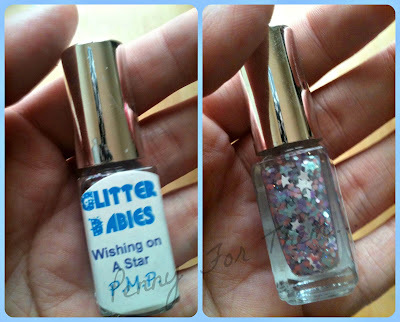 Theres also just a sachet that can be bought and you add your own clear polish and that's a brilliant £4. I don't know about you, but I'm gonna have to get one, just to try it out! Looks so much fun! Anyway, onto the ones i got to review for you guys. 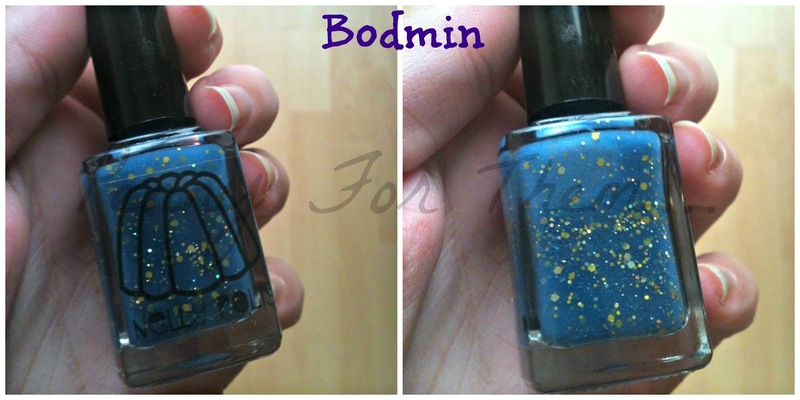 Ill start with Bodmin, which is a pale navy blue with a scattering of gold glitter which is a nice contrast. It is quite a thin consistency so i did 3 thin coats and a final fourth coat a little bit thicker and it added that extra coverage to make the layers more opaque but not losing the gold glitter in the earlier coats. Base coat used was Nails Inc Hyde Park, 4 coats of the polish and a thick coat of gelous to add a nice glossy shine. I thought while i had my polishes out and a few new ones id try to add to the Bodmin. I picked up the pretty & Polished "Rat a Tat", which is a clear based but bursting with teal and black glitter which i thought would look great in the Bodmin. Luckily, i was right and i think it just shows the polish can be very versatile! Love it either on its own or with some added glitz!! Next to test was the "Beeny". This is a much paler blue, almost a smokey sky blue with some small red glitter pieces. The glitter isn't the main component here, its the colour. The glitter goes well with it and makes it just that little bit different. Again, a thin consistency so 3 thin coats and one final fourth coat slightly thicker that once again made the polish opaque. And of course, i had to have another play with this one! As this is a much more delicate polish that the Bodmin, it needed a more softer and paler top coat to compliment it. I chose PMP's "Wishing on a Star" which has muted pastel colours in circles, stars and minute pieces of pale glitter thrown in. i think as a first collection, Hilary has one brilliant, and I'm itching to try the re hydrated formula! Just keep in mind that they're quite a thin consistency so needs maybe a coat or two more, but its a great polish, very hard wearing and look fantastic when a glossy top coat is added! However, if you like the matte, or textured look, due to the mineral pigments in this polish, it can be left just with the coats on for that kind of look aswell! Totally versatile which is always fun to have in the collection! Its brilliant to find a new and up and coming British Polish maker, and i hope you pop over to the Etsy shop to have a browse! Thank you to Hilary for allowing me to be one of the first to review her polishes and i wish her and the Nelly Polish alot of luck and hope they do really well!